Distribution has always been a problem for small literary magazines. The eco­nomics of producing a literary magazine means that, in most cases, editors would have to pay one of the mainstream distribu­tors to take on their products. Most maga­zines, therefore, rely on direct sales to a handful of more or less sympathetic book­shops and subscribers. Even here, howev­er, things are not all they should be. Bookshops will generally take between 25% to 40% of the retail price of the magazine and, as most bookshops will only take mag­azines on a ‘sale or return’ basis, the editors only get paid for the number of issues sold (or so the theory goes). Building up a sub­scription list can be just as daunting. Without the funds for effective publicity campaigns most magazines are forced to rely on ‘word of mouth’ and mentions or free ads in other magazines to attract poten­tial subscribers. There have been various attempts to change this situation by setting up co-oper­ative based small press distribution net­works and small press publicity campaigns. But to set up such a project costs money and the funding authorities, for the most part, seem content to hand money– out to a handful of magazines on an individual basis rather than to build up an infrastructure which would help all magazines. Recently a group of six magazines com­bined resources to produce what they call ‘The Small Press Package’. This scheme is essentially a sampler: for $21.50 you get the current issues of all six mags. Presumably, once you have a copy of all the magazines you can then decide which ones to sub­scribe to. The six magazines on offer are Going Down Swinging ‘a prose and poetry maga­zine that publishes the writing of new, unknown, and/or young writers’; On the off beat ‘a publisher of women’s short sto­ries and a focus for continuing support of good contemporary women’s fiction’; Studio a Christian literary journal ‘publishing poems, short stories and articles from established, new and aspiring writers’; Brave New Word ‘a publisher of contempo­rary Australian short stories and poetry, and sometimes interviews related to Australian writing and publishing’; Writing ‘a magazine coordinated by the Victorian Community Writing Committee. Writing gives preference to unpublished, or as yet unpaid writers, and to writing groups’; and The Famous Reporter ‘a short story maga­zine publishing the work of both new and established writers in a wide range of styles and themes’. One of the most ‘established’ of these magazines is Going Down Swinging which has just published its ninth issue. It was established by Myron Lysenko and Kevin Brophy in 1980 and has produced an aver­age of one issue a year since. Like many magazines it seems to have been born out of a feeling that the existing magazines were ignoring a section of the writing and reading community. In the editorial for the ninth issue Brophy and Lysenko, along with Associate editor Nolan Tyrrel, make the point that it is through magazines like Going Down Swinging that many writers make their first contact with editors. The comment and reaction they receive can be the first steps away from keeping their work to a small circle of friends’. Going Down Swinging has therefore always had a policy of ‘reacting specifically and personally to all submissions’. Probably as a result of this policy Going Down Swinging has become one of the more innovative magazines in Australia, consistently publishing original, interesting and non-mainstream work by new and/or unknown writers. Issue number nine is a good example of the success of this policy. The work in the issue ranges from the real­ism of Leah Nischler’s opening piece ‘Barbara Cartland does a bunk’ to the fast-moving prose in Doreen Sullivan’s ‘Johnny Fish-Face’ and the measured emotionalism of April Phillips’ (I’m sure that’s a pseudonym) ‘Cage, manger, rack’. 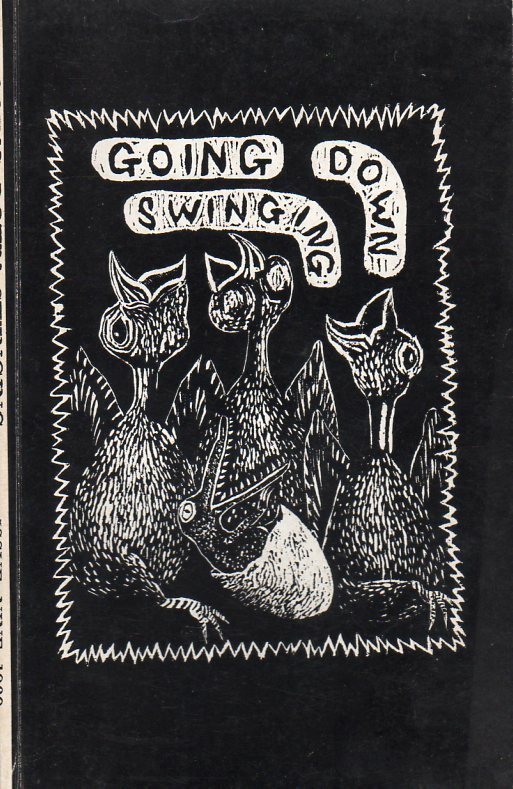 It’s interesting to note that the majority of work in this issue of Going Down Swinging is by women. Their confident experimentation is in contrast to the gener­ally ‘safer’ more literary work by the male contributors. If you’re interested in writing outside of the mainstream then Going Down Swinging number nine will provide you with an enjoyable introduction to a range of new(ish) innovative writers. Or better still choose from a cross-section of small liter­ary magazines from the Small Press Sampler. Mark Roberts is an editor of P76 magazine and has had wide experience in small press publishing. He will be writing a regular col­umn on small presses and magazines for Editions. *NOTE: The contact details and prices above are now out of date. Interesting to note that Walleah Press were responsible for the Small Press Pacakage. Collected Works Bookshop as it is now. Tom Shapcott, speaking at the Australian National Word Festival in Canberra earlier this year, claimed that a major concern facing the Literature Board (apparently now renamed the Literature ‘Unit’) when funding literary magazines was knowing when to ‘kill’ a magazine off. Although Shapcott was referring to the larger literary magazines which have become dependent on their annual injec­tion of Australia Council funds to keep afloat, such a comment coming from the director of the Literature Board must have been greeted with some irony by those in the audience who have been involved in the production of a small magazine and whose major concern was how to keep a magazine ‘alive’. The literary magazine debate at the 1989 Festival had indeed come full circle. Four years ago editors of small magazines virtually invaded the 1985 Festival. They held a meeting with the Literature Board (which included both funded and non-fund­ed magazines), ran their own very popular session at the Festival and sold small press publications in direct competition to the Co­op Bookshop stand. In the months leading up to the 1985 Festival a group of predominately Sydney editors had attempted to create an Australia-wide lobby group of magazine edi­tors and workers and small publishers. This group, known as Small Magazines And Presses (SMAP), did have some early successes. A number of articles on small literary presses appeared in the arts pages of the major dailies and the ABC radio pro­gram Books and Writing produced a special report on small presses. In Sydney Neil Whitfield, former editor of Neos (a maga­zine devoted to publishing creative writing by writers under 25) set up a small press stand at Harkers Bookshop in Glebe. Shortly before SMAP took off in Sydney, Collected Works Bookshop opened in Melbourne. 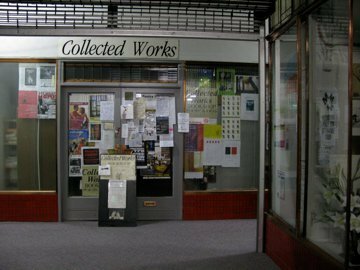 Collected Works attempted not only to be a small press bookshop but also to distribute Australian and international small press publications. Although not directly related to SMAP it is possible to see Collected Works as port of a ‘small press push’ in the early to mid eight­ies. A push which, for a while, seemed as though it was going to force the literary establishment to take notice. Despite promising so much at the 1985 Word Festival SMAP eventually died a slow death. The problems that plague editors of small magazines were compounded with SMAP. The main movers behind SMAP were magazine editors who suddenly found themselves not only juggling employment commitments, editing, funding, producing and distributing a small literary magazine but also attempting to set up an Australia-wide lobby group of small presses and even examining proposals for a national small press distribution network. In retrospect it is not a surprise that SMAP collapsed, but that it got so far along the track, with virtu­ally no support from the federal or state arts bodies, before the wheels fell off. So, was it worthwhile? Well there were some spin-offs. Contacts were made, a net­work was set up between magazine editors in different regions and, for a period, liter­ary magazines and journals gained at least a little of the literary spotlight. SMAP also kept careful records and if, in the future, small magazines and presses are in a posi­tion to lobby collectively for a better deal from the literary establishment, much of the groundwork will already have been done. The whole area of small cultural maga­zines is, with a few exceptions, is virtually ignored by the major newspapers and radio programs which claim to have a cultural bent. SMAP attempted to change this, and for a short while perhaps it did. Even when the literary or cultural establishment does make a concerted effort to acknowledge the existence of literary journals, it is generally a very blinkered, conservative acknowl­edgement. A good example of this occurred a number of years ago when Books and writing introduced a regular literary maga­zine segment. Almost exclusively the reviewer concentrated on the established, Literature Board funded magazines like Meanjin, Island, Quadrant and Overland. Over the coming months in EDITIONS I will attempt to do something quite differ­ent. To fully appreciate the importance of small magazines and publishing, one has to look beyond the established magazines to the diversity that exists across the whole range of literary and cultural publishing. So while I will be following the creative and critical writing appearing in the major jour­nals, I will also be searching out the innova­tive, outrageous or merely interesting among the smaller, and often more vibrant, magazines. At the same time I intend to highlight the politics of small press publish­ing and to look back at some of the more influential literary magazines of the past twenty years in an attempt to understand the context in which contemporary maga­zines are operating today. While Harkers Bookshop closed some years ago Collected Works Bookshop is still going strong in Melbourne. After a number of moves they are now on the 1st Floor of the Flinders Way Arcade, 238 Flinders Lane Melbourne 3000 (03 654 8873).